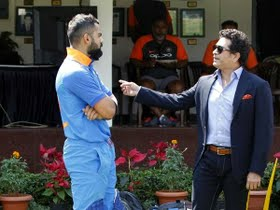 With Australia without stalwarts Steve Smith and David Warner, India legend Sachin Tendulkar feels it is a great chance for India to create history in a country where they have traditionally struggled. "I think we have a huge opportunity. The Australian team does not look the same Australian side that it used to be and with Smith and Warner not there, this is a great opportunity to go out and do something special," Tendulkar was quoted as saying in a PTI report. Smith and Warner are serving a one-year ban and Cameron Bancroft nine-month suspension for their alleged involvement in the ball-tampering scandal. Asked about if he would like to see the Aussie duo back, Tendulkar, who was speaking at the camp of the Tendulkar Middelsex Global Academy began at the D Y Patil Stadium, said, "I would want to see good cricket for sure. They both are world-class players. So I don't want to get into that debate whether the ban should be reduced or not." India kick off the tour with three T20s, followed by a four-match Test series, with the first Test at Adelaide on December 6.